Catalogue: design by Nadav Shalev, preface by Chen Tamir, conversation with Dr. Roy Brand (also online in Erev Rav, Hebrew only). Eng+Heb, 74 pages. Available at the CCA Tel Aviv and the Tel Aviv Museum bookshop. For international purchasing: Sternthal Books. 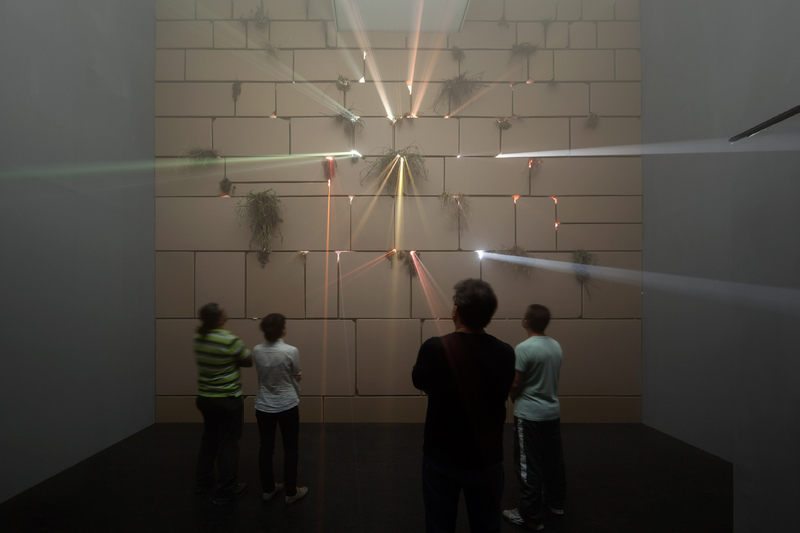 "...For “Above and Beyond,” originally planned for and commissioned by the Center for Contemporary Art (CCA) Tel Aviv, Rodeh has grafted onto a white cube one of the holiest sites of Judaism and the most popular pilgrimage site in Israel, the Wailing Wall – or, rather, an abstract recreation of the wall constructed of cardboard. The viewer walks into a dark, smoky room, filled with Oriental music. The rhythmic melody is reminiscent of snake charming, calling to mind the performative manipulation of this highly symbolic reptile through its master’s hypnosis. The music, recorded especially for the work by Israeli composer Yoni Silver, is made by the human body as instrument: whistles, claps and foot stomps, that tantalizes and draw to the light piercing through the cracks between the wall’s “stones.” Clearly alluding to rays of holy light, Rodeh’s beams punch through the wall almost like stained glass windows in a cathedral. The wall, where the Jewish people have come for generations to pray and wish and fling their faith against a stone fence, stands almost as if to entertain it’s new pilgrimage. Rodeh takes her inspiration not only from the Wailing Wall itself, but from Holy Land theme parks and biblical video games, from recreated Jewish icons rented for Bar and Bat Mizvahs and Las Vegas chic, and from the show business of religion. Rodeh’s radical reconfiguration of the gallery space calls into question common ideas of cultural and religious tourist sites, and juxtaposes the mechanisms of both. Viewers become both worshipers and tourists, who are asked: Does walking up to the wall and realizing it’s made of cardboard disappoint or entertain? What does it take to generate religious and artistic ecstasy? “Above and Beyond” aims to create a visual and sensorial dissonance that contrasts religion and art through a confluence of the two, leading viewers to consider the spiritual dimensions of art and the visual and physical expressions of religion."